Artist inspiration and artist influences. No biographies, dates or scholarly research here - this is a personal response to the work of Pro Hart by Australian artist Fiona Morgan. A few months ago I was in Broken Hill, which aside from being a desert mining town in outback NSW, is also -bizarrely- filled to the brim with artists. 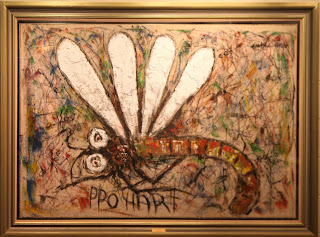 And I made my way to Pro Hart's studio/museum (he died in 2006), as someone not particularly familiar with his work, but curious to find out more about the painter of the dragonfly on carpet. Well I found the original dragonfly (pictured here) and love it. And I also found a painter of huge variety. And what I have taken away and appreciate so much about Pro Hart is his inventiveness, his experimenting and his lack of taking notice of other people's rules in his artwork. I actually don't like most of his work. But I love the inquisitiveness and energy that drives it. As I mentioned, he painted on carpet. A surprising choice of canvas, but what stunning textured results! He also painted cars (yes! ), fired paint from home made cannons (what fun! ), dropped paint from balloons (weehee) and often used oils in a very thin glaze with scratching into it which is a technique I've not come across before in oils (It can be really effective, not to mention quick). I admire the sense of using whatever might work, however seems appropriate. That's creativity. Art critics be buggered. The energy in these works is infectious. They're probably a conservators nightmare. They aren't traditional. They aren't high brow. They're accessible. And most of all, they're experimental, which is why Pro Hart is showcased here as an influence on my artistic journey. And now, that carpet video.... enjoy. THANK YOU for this post! I was just trying to explain to an English-born colleague why I looked at my desk and declared "Oh Meester Hart. What a mess!" Watching the ad again brought back wonderful memories. My pleasure! It's such an iconic ad to me. No idea who it was selling for, but I'll always remember the freedom of the painter.